Utility class that construct a planar graph from the input vector layers and provides shortest path search for tracing of existing features. Definition at line 43 of file qgstracer.h. Max feature count threshold was reached while reading features. Start point cannot be joined to the graph. End point cannot be joined to the graph. Points are not connected in the graph. Definition at line 132 of file qgstracer.h. Definition at line 600 of file qgstracer.cpp. Allows derived classes to setup the settings just before the tracer is initialized. This allows the configuration to be set in a lazy way only when it is really necessary. Default implementation does nothing. Definition at line 158 of file qgstracer.h. Returns the CRS used for tracing. Definition at line 63 of file qgstracer.h. Definition at line 78 of file qgstracer.h. Given two points, find the shortest path and return points on the way. Definition at line 739 of file qgstracer.cpp. Whether there was an error during graph creation due to noding exception, indicating some input data topology problems. Definition at line 129 of file qgstracer.h. Build the internal data structures. This may take some time depending on how big the input layers are. It is not necessary to call this method explicitly - it will be called by findShortestPath() if necessary. Definition at line 678 of file qgstracer.cpp. Definition at line 690 of file qgstracer.cpp. Whether the internal data structures have been initialized. Definition at line 122 of file qgstracer.h. Definition at line 806 of file qgstracer.cpp. Gets layers used for tracing. Definition at line 55 of file qgstracer.h. Gets maximum possible number of features in graph. If the number is exceeded, graph is not created. Definition at line 109 of file qgstracer.h. Gets offset in map units that should be applied to the traced paths returned from findShortestPath(). Positive offset for right side, negative offset for left side. Definition at line 87 of file qgstracer.h. Definition at line 664 of file qgstracer.cpp. Sets the crs and transform context used for tracing. Definition at line 637 of file qgstracer.cpp. 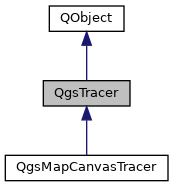 Definition at line 650 of file qgstracer.cpp. Sets layers used for tracing. Definition at line 605 of file qgstracer.cpp. Definition at line 111 of file qgstracer.h. Set offset in map units that should be applied to the traced paths returned from findShortestPath(). Definition at line 659 of file qgstracer.cpp. Definition at line 671 of file qgstracer.cpp. Sets the renderContext used for tracing only on visible features. Definition at line 644 of file qgstracer.cpp.